Ok, so as much as I want the spring to come, there is just something quite magical about the snow in New York. Maybe because it’s the only time the rumbling street noises are muffled outside my window, or maybe it’s that no one will show up at work tomorrow so I’ll sneak a snow day (even though I walk to work), or maybe, just maybe, I’m not quite ready to bare my non-bikini clad body out there to the brazen sun. Yeah, maybe all those things. But for now, I’ll just open up the window and smell the cold and snow and pretend I’m in Jackson Hole with a bear rug, fireplace, glass of wine, and that hot hot guy I met on the slopes. Tomorrow? Time enough for reality. 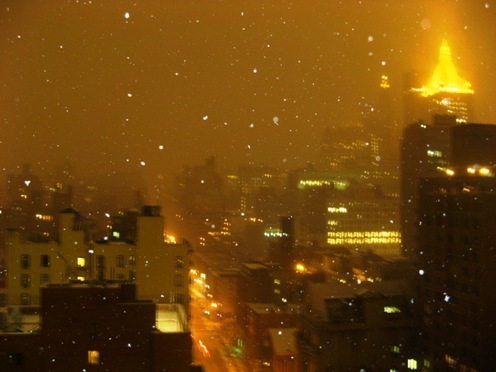 I would love to be in NYC for a snowstorm. I live in Jackson Hole..lots of snow here..but no bear skin rug! Well, in one day the snow turns black, so, Jackson Hole takes the cake for me!